GOMA, Democratic Republic of Congo — Residents settled into an uneasy calm today “under our new masters,” a day after mutineers from the Congolese army, now leaders of the M23 military wing, forced government troops, or FARDC, out of the city and took control of the lucrative border crossing between Congo and Rwanda. While over a thousand people flocked to Goma stadium to hear from the M23 leaders about their plans, Congolese President Joseph Kabila, Rwandan President Paul Kagame, and Ugandan President Yoweri Museveni held emergency meetings in the Ugandan capital aimed at stemming the widening crisis. "The journey to liberate Congo has started now,” M23 spokesman Vianney Kazarama told the crowd gathered at the rally. “We're going to move on to Bukavu and then to Kinshasa. Are you ready to join us?" 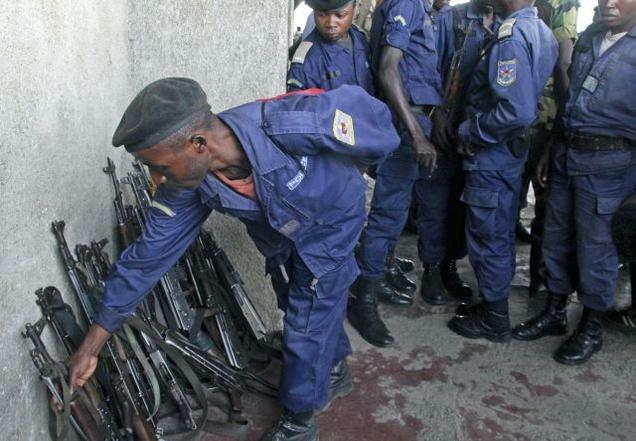 The rebels claimed that they are now in control of Sake, a town 17 miles northwest of Goma on the road toward Bukavu, another key town in eastern Congo and the capital of South Kivu province. The high-level talks in Kampala have resulted in two interesting twists. First, President Museveni said that he is asking M23 to withdraw from Goma and not to advance further into Congo. Second, President Kabila agreed that he would meet M23 to examine their grievances. Several more key steps must be taken, but these statements were positive steps that could help lay the groundwork for a more comprehensive peace process. Furthermore, foreign ministers from across Africa’s Great Lakes region today reiterated their call for African countries to contribute troops to an international force to militarily take on the M23 rebels. "The meeting called on the African Union's Peace and Security Council to mandate the neutral international force and seek the support of the United Nations Security Council to deploy the neutral force," said a spokesman for the Ugandan government. But calls for another military force to deploy in volatile eastern Congo highlight a central challenge in the current crisis: The fact that a 17,000-troop strong U.N. peacekeeping mission, MONUSCO, is already in place in the East. MONUSCO’s mandate gives peacekeepers broad authority to use force in the protection of civilians and, as of June, to support the FARDC in its "action against armed groups, especially mutineers of ex-CNDP and M23." But the mission claims that it is hamstrung when it doesn’t have a national army to bolster, as was the case during the late stages of the operations that led to Goma’s fall into rebel hands. "MONUSCO, of course, cannot substitute for the efforts of national security forces including the FARDC," said Eduardo del Buey, U.N. Secretary-General Ban Ki-moon's spokesman. "The U.N. peacekeepers' use of force is principally to protect civilians and not to engage in armed confrontation for a broader military purpose," he said. In a meeting yesterday evening, the U.N. Security Council called on the secretary-general to report in the coming days on options for potential redeployments that would enable the peacekeeping mission to better protect civilians and track the flows of arms across Congo’s borders. Ahead of the meeting, a coalition of human rights groups, including the Enough Project, called for the imposition of sanctions “against all individuals identified in the most recent Group of Experts report as violating the U.N. arms embargo on Congo, including the Rwandan military and political officers supporting and directing the M23.” The coalition also urged bilateral donors to recognize Rwanda’s link to M23 by expanding the suspension of all aid programs not explicitly allocated for humanitarian needs. The resolution adopted last night expanded sanctions against M23 leaders to include Innocent Kaina and Baudouin Ngaryu but notably failed to identify Rwandan or Ugandan officials implicated by the U.N. Group of Experts. It also allowed for the creation of a special envoy to the region but does not lay out a clear mandate for the post. "With the regional capital that Secretary of State Hillary Clinton visited three years ago under siege, now is the time for her to show leadership in helping end the crisis,” said Sasha Lezhnev, senior policy analyst at the Enough Project. While the diplomatic efforts proceed—rife with uncertainty, given the still publicly vague aims of both M23 and Rwanda—the situation on the ground remains tense and fluid. Fears of targeted killings by the M23 against suspected opponents last night did not come to pass, but serious concerns remain. Police and soldiers with the government are making the calculation to join the rebels, if only to restore stability. The border with Rwanda, now manned by M23 rebels, is open, with people and goods passing freely between the two countries, most notably: minerals. Even before the rebels claimed the provincial capital yesterday, a convoy of six trucks transporting tin and coltan reportedly passed straight through to Rwanda on Monday, amid the chaos of the offensive, eyewitnesses told Enough. The shipment underscores the value of the M23-Rwanda alliance for allowing the free flow of eastern Congo’s natural resources into Rwanda, as was the case during the reign of International Criminal Court indictee and M23 founder Bosco Ntaganda before he mutinied in late March 2012. Now more than ever is the time for a comprehensive peace process for eastern Congo that actually addresses the critical issues that the parties never normally discuss – economic, political, and security interests. Secretary Clinton should work with the U.N. to appoint a senior mediator to this process and appoint a senior U.S. envoy to work directly with the mediator. Furthermore, the U.S. and U.N. Security Council must expand sanctions against all parties that are blocking peace — from M23, Rwanda, Congo, and Uganda. Only then is there a chance to calm the chaos.